Donni, a 15-week-old cheetah cub, has had an exciting stay at the Cincinnati Zoo so far. 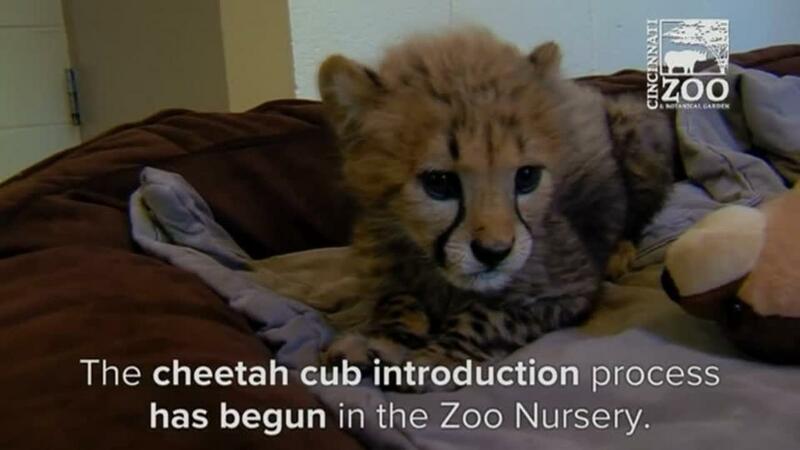 The baby cheetah became a resident of the zoo after being abandoned by his mother. Zoo staff provided Donni with an adorable companion: Moose, a chocolate labrador puppy. According to a video of Donni and Moose posted on the Cincinnati Zoo's Facebook page, the pair will grow up together and will provide social interaction and physical activity. Moose has already taught Donni some boundaries, like how to be more gentle when playing. Donni is a part of the zoo's Cat Ambassador Program, which means he will be going outside the zoo to visit schools and organizations to education children. The boundary-setting skills Moose is teaching are essential so Donni can be around humans. This is not the first time cheetah cubs at the Cincinnati Zoo have made news. A few months ago, a cheetah named Willow passed away after giving birth to five cubs by C-section. Along with zoo staff, an Australian shepherd, Blakely, acted as a nursery companion to comfort the babies. When the cubs were first born, Blakely was merely a friend for the cubs. As they grow older, he will become a sort of role model and teacher. He has already taught one cub, Savannah, the difference between play biting and fighting. Cheetah cubs and puppies may seem like an odd pairing, but studies have shown they make great companions. Zoologists have discovered that dogs can have a calming effect on cheetahs; they have been setting up cheetah-dog friendships for about three decades.